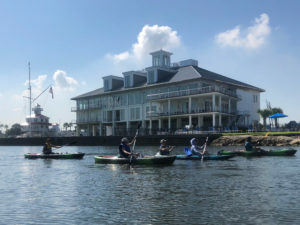 This is a very exciting collaboration between Kayak-iti-Yat (us) and Lake Pontchartrain Basin Foundation! These are The Folks who saved Lake Pontchartrain and her associated waterways from misguided developments and decisions and their mostly unintentional negative consequences. They continue to monitor and maintain the lakes, bayous, rivers and wetlands in the region while educating all ages locally and internationally. The tour lasts about two hours and includes paddling for close to an hour and a half followed by a tour of the New Canal Lighthouse museum. We’ll meander through the marinas among sailboats, yachts and waterside seafood restaurants. If the wind is in our favor, we’ll venture a bit out into the lake to check out the Coast Guard station and one of the magnificent pumping stations keeping the city dry. 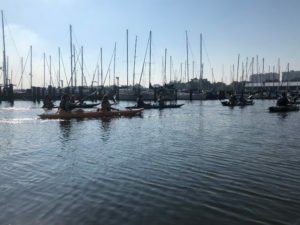 Similar to our Bayou St. John tours, you’ll learn about the history, ecology, benefits and challenges relevant to West End. Due to motorboat traffic and safety concerns, only children 13 years and older can participate. Available by reservation only, we offer the Lake and Lighthouse Tour three days a week, year-round. We take a minimum of 2 kayakers. We use single sit-on-top kayaks with a size limit of 6’1” and 265 lbs.